حیدری رارانی, محمد, علی میرزایی, سجاد, ترابی, کیوان. (1394). حل تحلیلی ارتعاشات آزاد نانو ورق دولایة تقویت شده با نانولوله‌های کربنی مدرج تابعی واقع در بستر الاستیک. 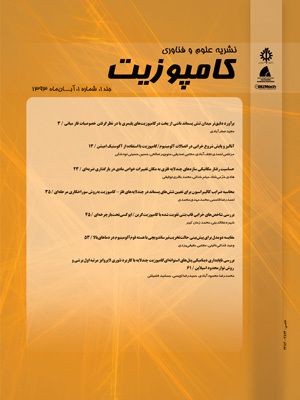 علوم و فناوری کامپوزیت, 2(3), 55-66. محمد حیدری رارانی; سجاد علی میرزایی; کیوان ترابی. "حل تحلیلی ارتعاشات آزاد نانو ورق دولایة تقویت شده با نانولوله‌های کربنی مدرج تابعی واقع در بستر الاستیک". علوم و فناوری کامپوزیت, 2, 3, 1394, 55-66. حیدری رارانی, محمد, علی میرزایی, سجاد, ترابی, کیوان. (1394). 'حل تحلیلی ارتعاشات آزاد نانو ورق دولایة تقویت شده با نانولوله‌های کربنی مدرج تابعی واقع در بستر الاستیک', علوم و فناوری کامپوزیت, 2(3), pp. 55-66. حیدری رارانی, محمد, علی میرزایی, سجاد, ترابی, کیوان. حل تحلیلی ارتعاشات آزاد نانو ورق دولایة تقویت شده با نانولوله‌های کربنی مدرج تابعی واقع در بستر الاستیک. علوم و فناوری کامپوزیت, 1394; 2(3): 55-66. در این پژوهش، ارتعاشات آزاد یک نانو ورق ناهمسانگرد دو لایه‌ی تقویت شده با نانولوله‌های کربنی به‌صورت تحلیلی حل شده است. نانو‌لوله‌های کربنی در راستای ضخامت ورق به‌صورت مدرج تابعی با دو فرم یکنواخت و کاهشی-افزایشی توزیع شده‌اند. محیط الاستیک اطراف ورق به‌صورت بستر الاستیک پاسترناک مدل‌سازی شده و اثرات نیروی واندروالس بین دو لایه نیز لحاظ شده است. معادلات حاکم با استفاده از روش انرژی و تئوری غیر محلی ارینگن به‌دست آمده و برای یک ورق مستطیلی با شرایط مرزی چهار طرف تکیه‌گاه ساده با استفاده از روش ناویر حل شده‌اند. در نهایت، اثر پارامترهای مختلف مانند ثابت فنری نوع وینکلر، ثابت برشی نوع پاسترناک، چیدمان‌های مختلف ذرات نانو و پارامترهای غیر محلی روی رفتار ارتعاشی نانو ورق دو لایه بررسی شده است. نتایج به‌دست آمده نشان می‌دهند با افزایش ثابت فنری نوع وینکلر فرکانس طبیعی نانو ورق افزایش می‌یابد در حالی‌که تاثیر ثابت برشی نوع پاسترناک بر فرکانس طبیعی نانو‌ ورق دولایه بسیار کم است. همچنین با افزایش ضریب غیرمحلی در یک طول ثابت نسبت فرکانس طبیعی کاهش می‌یابد. با افزایش نسبت طول به ضخامت ورق (L/h) فرکانس طبیعی غیر محلی کاهش پیدا کرده و در (L/h) ثابت، فرکانس طبیعی چیدمان کاهشی-افزایشی بیشتر از توزیع یکنواخت می‌باشد. نتایج حاصل از این تحقیق می‌تواند در ساخت وسایل نانو استفاده شده و همچنین الگویی برای ادامه کارهای دیگر باشد. In this paper, free vibration of an embedded double-layered nano-plate reinforced by functionally graded carbon nanotubes (FG-CNT) is analytically investigated. Carbon nanotubes are distributed through the thickness in two ways: uniform distribution and symmetrically linear distribution (or decreasing-increasing layup). To accurately model this nanocomposite behavior, the elastic medium around the nano-plate is modeled by Pasternak elastic foundation and the Van der waals forces between two nano-plates are taken into account. Governing equations of motions are obtained using energy method in association with Eringen nonlocal theory and solved by Navier method for a simply-supported rectangular plate. Finally, the effect of elastic foundation parameters, different distributions of CNT and nonlocal parameters are investigated on the vibration behavior of orthotropic double-layer nano-plate. Results show that natural frequencies of a double-layer nano-plate increase by increasing the Winkler elastic constants while Pasternak elastic constant has less effect on the results. Also, increasing the nonlocal parameter at a constant length decreases the natural frequencies. By increasing the length to thickness ratio (L/h) of nano-plate, the nonlocal frequencies reduce and natural frequency of symmetrically linear distribution is more than those of uniform distribution for constant value of L/h. Fennimore, A.M. Yuzvinsky, T.D. Han, W.Q. Fuhrer, M.S. Cumings J. and Zett, A., “Rotational Actuators Based on Carbon Nanotubes,” Nature, Vol. 424, pp. 408-410, 2003. Leung, A.Y.T. Wu, Y.D. and Zhong, W.F., “Computation of Young’s Moduli for Chiral single-Walled Carbon Nanotubes,” Applied Physics Letters, Vol. 88, 2006. doi: 10.1063/1.2396843. Gibson, R.F. Ayorinde, E.O. and Wen, Y.F., “Vibrations of Carbon Nanotubes and Their Composites: A Review,” Composites Science and Technology, Vol. 67, pp. 1-28, 2007. Eringen, A.C., “On Differential Equation of Nonlocal Elasticity and Solutions of Screw Dislocation and Surface Waves,” Journal of Applied Physics, Vol. 54, pp. 4703-4710, 1983. Ghorbanpour arani, A., Mohammadimehr, M. and Arefmanesh, A., “Transverse Vibration of Short Carbon Nanotubes Cylindrical Shell and Beam Models,” Journal of Mechanical Engineering, Vol. 224, pp. 745-756, 2010. Mohammadimehr, M. Rousta Navi, B. and Ghorbanpour Arani, A., “Free Vibration of Viscoelastic Double-Bonded Polymeric Nanocomposite Plates Reinforced By FG-SWCNTs Using MSGT, Sinusoidal Shear Deformation Theory and Meshless Method,” Composite Structures, Vol. 131, pp. 654–671, 2015. Pradhan, S.C. and Phadikar, J. K., “Nonlocal Elasticity Theory For Vibration of Nanoplates,” Journal of Sound and Vibration, Vol. 325, pp. 206-223, 2009. Wang, Y.Z. Li, F.M. and Kishimoto, K., “Scale Effects on Flexural Wave Propagation in Nanoplate Embedded in Elastic Matrix With Initial Stress,” Journal of Applied Physics, Vol. 99, pp. 907-911, 2010. Narendar, S. and Gopalakrishnan, S., “Study of Terahertz Wave Propagation Properties in Nanoplates With Surface and Small-Scale Effects,” International Journal of Mechanical Sciences, Vol. 64, pp. 221-231, 2012. Narendar, S. and Gopalakrishnan, S., “Temperature Effects on Wave Propagation in Nanoplates,”Composite Part B, Vol. 43, pp. 1275-1281, 2012. Goodarzi, M. Mohammadi, M. Farajpour, A. and Khooran, M., “Investigation of The Effect of Pre-Stressed on Vibration Frequency of Rectangular Nanoplate Based on a ViscoPasternak Foundation,” Journal of Solid Mechanics, Vol. 6, pp. 98-121, 2014. Babaei, H. and Shahidi, A.R., “Small-scale Effects on the Buckling of Quadrilateral Nanoplates Based on Nonlocal Elasticity Theory Using the Galerkin Method,” Archive of Applied Mechanics, Vol. 81, pp. 1051-1062, 2011. Murmu, T. and Adhikari, S., “Nonlocal Vibration of Bonded Double-Nanoplate-Systems,” Composites: Part B, Vol. 42, pp. 1901-1911, 2011. Murmu, T., and Pradhan, S.C., “Small-Scale Effect on the Free In-Plane Vibration of Nanoplates by Nonlocal Continuum Model,” Physica E: Low-dimensional Systems and Nanostructures, Vol. 41, pp. 1628-1633, 2009. He, X.Q, Wang, J.B. Liu, B. and Liew, K.M., “Analysis of Nonlinear Forced Vibration of Multi-Layered Ggraphen Sheets,” Computational Materials Science,Vol. 61, pp. 194-199, 2012 . Ghorbanpour Arani, A. Kolahchi, R. Mosallaie Barzoki, A. Mozdianfard, M.R. and Noudeh Farahani, S.M., “Elastic Foundation Effect on Nonlinear Thermo-Vibration of Embedded Double-Layered Orthotropic Graphene Sheets Using Differential Quadrature Method,” Mechanical Engineering Science, Vol. 227, No. 4, pp. 862-879, 2012. Mohammadimehr, M. Mohandes, M. and Moradi, M., “Size Dependent Effect on the Buckling and Vibration Analysis of Double-Bonded Nanocomposite Piezoelectric Plate Reinforced by Boron Nitride Nanotube Based on Modified Couple Stress Theory,” Journal of vibration and Control, DOI: 10.1177/1077546314544513, 2014. Liewa, K.M. Lei, Z.X. and Zhan, L.W., “Mechanical Analysis of Functionally Graded Carbon Nanotube Reinforced Composites,” A review, Compos. Struct. Vol. 120 pp. 90–97, 2015. Timoshenko, S. and Woinowsky-Krieger, S., “Theory of Plates and Shells,” 2nd ed., London: Mc Gyaw-Hill, 1959. Ghorbanpour Arani, A. and Roudbari, M.A., “Nonlocal Piezoelastic Surface Effect on the Vibration of Visco-Pasternak Coupled Boron Nitride Nanotube System under a Moving Nanoparticle,” Thin Solid Films, Vol. 542, pp. 232-241, 2013. Pradhan, S.C. and Kumar, A., “Vibration Analysis of Orthotropic Graphene Sheets Embedded in Pasternak Elastic Medium Using Nonlocal Elasticity Theory and Differential Quadrature Method,” Computational Materials Science, Vol. 50, pp. 239-245, 2010.